Mardi Gras is one holiday that everyone has to experience at least once in their lifetime. If you can’t make the 10.5 hour drive, then have no fear for the most important day of the celebration is right here in Louisville at these various locations. Eat your heart out on Po Boys, drink yourself silly on Hurricanes, and wear your Mardi Gras beads with pride! And, we must mention, be responsible too! Live music, Lots of Beads, King Cake, $3 Fireball Shots, $3 Cajun Beer (Abita and Dixie brands), $5 Hurricanes with a Souvenir Mardi Gras Cup. Celebrate all weekend long! For more information, click here. “Why should New Orleans have all the phun?” Good question. 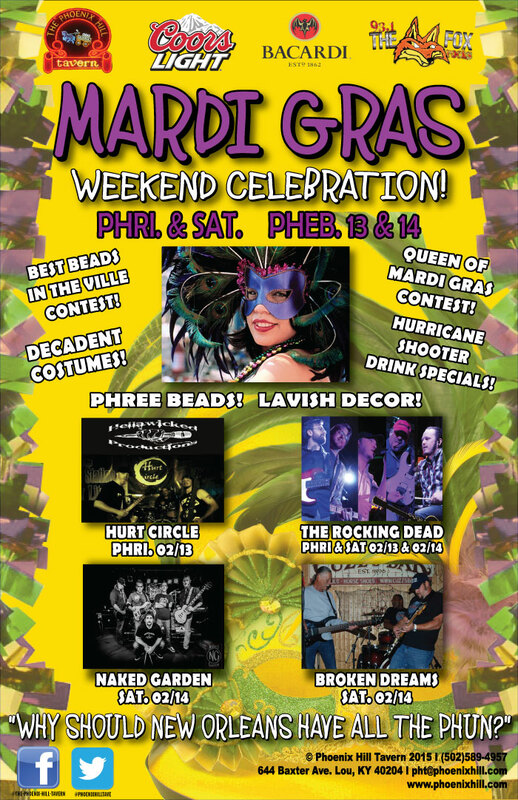 Head down to Phoenix Hill Tavern to experience one of the best Mardi Gras parties in the city. Costumes are encouraged and drinking Hurricanes is required. With live music from Hurt Circle, The Rocking Dead, Naked Garden, and Broken Dreams, this is one party you won’t want to miss. For more information, click here. Play’s Mardi Gras | February 14, 10 p.m. - 4 a.m. Missed Cher in concert this past summer? Don’t worry. Join Play for the special appearance of Chad Michaels, the nation’s #1 Cher impersonator. Tickets are $12. Roux’s Fat Tuesday Party | February 17 11 a.m. - February 18 2 a.m.
You definitely don’t want to miss Roux’s first annual Fat Tuesday Celebration! Where else can you find the very best Cajun food in town? They will be parting in true NOLA fashion with the very best classic cuisine including: Freshly shucked oysters, jambalaya, gumbo, etouffee, dirty rice, red beans and rice & po' boys. Along with that awesome menu comes live music all day, drink specials and beads! For more information, click here. Sneaux Day! | February 17 11 a.m. - February 18 2 a.m. In place of Roux's Fat Tuesday Party (new date TBA), come out to Roux to celebrate Louisville's collective snow day! Warm up with 10 dollar Po'Boys and rice dishes, fresh shucked oysters and beignets. Live music by Act of God 7 p.m. - close. Mardi Gras Planetarium Party | February 17, 1:30 - 5 p.m. Celebrate Mardi Gras at the Rauch Planetarium. This family-friendly event is the perfect celebration for the the little ones. With performances from UofL’s School of Music’s Steel Drum Band to the making of themed Mardi Gras crafts to the showing of, “Perfect Little Planet,” this will be the start of annual planetarium celebration. Admission is $5. For more information, call (502) 852-6171. BBC St. Matthews & BBC 4th Street Fat Tuesday Celebration | February 17, 6 p.m. Celebrate Fat Tuesday with the annual Bluegrass Brewing Company party! From Hurricane drinks to Po Boys, the brewpubs will be decorated in festive Cajun style with Mardi Gras beads and party favors. On the menu is the best of the best Cajun food- boiled shrimp, fresh boiled crawfish, oysters, gumbo, king cake, etouffee, jambalaya. For more information, click here. Fourth Street Live! Mardi Gras Festival | 7 p.m.
To get a small taste of the actual Mardi Gras celebration, head down to Fourth Street Live! for live music, a cake eating contest, a bead wearing competition, a chance to win Miley Cyrus tickets, and if you’re really feeling fun, you can even for the Bar Crawl. Image courtesy of Shutter Stock.